'Melbourne, where are we going?' is an interactive web visualisation platform that allows the user to explore the relationship of both transport and housing in Victoria - an area where Melbourne and many other Australian cities face many challenges. This is achieved through the numerous open datasets related to transport, the built environment and socioeconomic indicators. This is an initial prototype targeted as policy / planning tool, a tool to communicate upcoming issues to the public, as well as just an interesting way to communicate data that affects us all. For this reason we have applied for a number of categories related to planning, governance, policy, data journalism, innovation and connected communities. The interactive visualisation utilises the recently released PTV General Transit Feed Specification (GTFS) data, extrapolating it into a temporal visualisation of the public transport network movements over time. In this demo, we simulate the approximately 500,000 train stop arrivals that occur throughout the day in Victoria, as a proof-of-concept for the whole transit network. At the first instance, this enables the data to be seen in a much more engaging way, and at a network level rather than simply a timetable format. This allows users / policy-makers to see how well-serviced an area is during different parts of the day. We all live different lives and adhere to different schedules, so this can firstly help match our lifestyle choices and personal circumstances (such as employment industry or location) with where we live, where we'd like to live, or (if we are a policy-maker) where we should be planning people to live. One of the factors that distinguishes this between other GTFS-related visualisations is the next dataset. This tool integrates Building Permit Approval data from 2011 to 2014, which is used in order to measure growth in urban development. This allows us to compare where the city is growing in comparison to the level of service the transport network is currently achieving. The challenge with this data is in its geolocation to integrate with the mapping format. This data is very detailed, yet the lowest level of geography provided is street. Here, we mashed the data with the approximately 4,000,000 points in VicMap Address data in order to create an address-weighted estimate of the geolocation of these building approvals over time at a point level. The data was cleaned and filtered to be those used is only for those able to be geocoded for these sets, and only for domestic / residential dwellings. The third dataset used is the VAMPIRE Index, developed by Griffith University and provided by AURIN. This index can be used to help describe the issue we are explaining and provides a robust description to face, and explain the situation in 2011 and whether or not this is getting worse over time. This index combines our narrative between transport and housing - providing a robust base on which to make sense of the data post-2011. 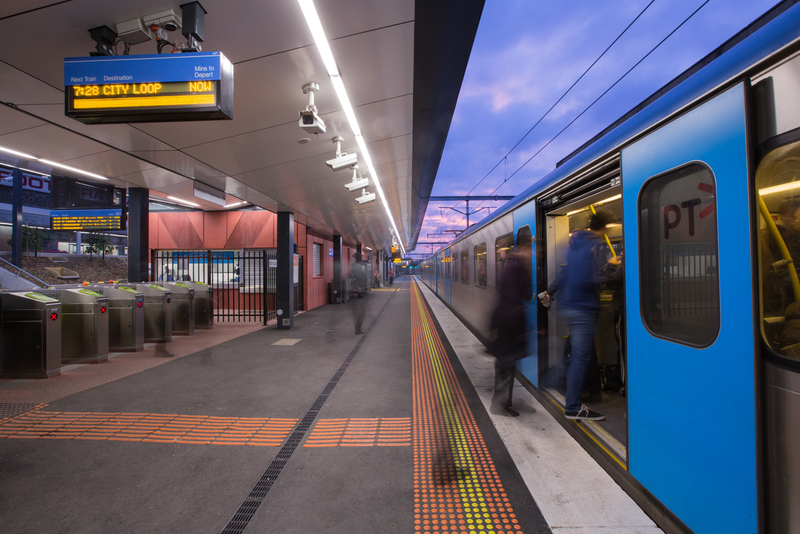 Future Development: The GTFS data feed is now available in most Australian cities, and would further be applied to create similar tools that are tailored to their transit agencies. Other Australian cities also have similar building permit data, and the VAMPIRE index has been developed by Griffith for multiple as well. As both the GTFS data and the building permit data are regularly updated feeds, if they are collected and archived over time we will be able to further develop this tool in order to track these relationships over time.